This chapter engages critically engages the history and geopolitics of the Arab-Islamic world. By integrating history, policy analysis, and neuroscientific insights on leadership and political change, this chapter conveys a more holistic understanding of endogenous and exogenous factors that have shaped and continue to shape the region. It also charts a way forward for sustainable, secure and prosperous governance paradigms specific to each area within the region. Globally, it advocatesa more thorough acknowledgment of the Arab-Islamic contributions to human civilization, and a greater appreciation for what the author calls the “Ocean Modelof Human Civilization”, where cultures are interconnected, cumulative, and where cultures do not arise ex nihilo. In the early years of the 20th century, the region of the Balkans was often referred to as the “powder keg of Europe”. The animosities in the region, surging nationalistic sentiments in the newly independent states, and Great Power meddling meant the region was seething with discord. These tensions reached a breaking point that finally escalated into war: the First World War started after the assassination of Archduke Franz Ferdinand of the Austro-Hungarian Empire by Gavrilo Princip, a Bosnian nationalist. No conflict in the Arab-Islamic world has ever started a world conflagration of the magnitude of either WWI or WWII but the region has been at the heart of global politics and a hotbed of incessant power plays since the early years of the 20th and into the 21st centuries. In fact, few conflicts across the Arab-Islamic world in the past six decades have remained local, despite never escalating into a full-blown “world” conflagration. Nevertheless, they implicated internal and external actors, and had immense human and material costs, with spillover effects across the globe. The number of casualties, severity of injuries and destruction left behind by successive wars and invasions in the area are so pronounced in magnitude that they are virtually impossible to quantify. One thing is certain and that is the fact that the Arab-Islamic world has had anything but a marginal place in international politics; the geopolitics of the Arab-Islamic world are profoundly tied to world politics and have implications far beyond the region’s borders. 1. 1915-22, when the Arab world was divided by colonial powers; 2. the British withdrawal from Palestine and the emergence of the Palestinian question; 3. the 1967 war and the Arab defeat; 4. the 1979 revolution in Iran and its after effects for regional politics; 5. 1987-1991, a critical interval when the Palestinian intifada and the first Gulf war started; 6. 11 September 2001, the attacks in the US and the US-led invasion of Afghanistan and subsequently Iraq.1 The series of protests and political upheavals known as the Arab Spring, which started in late 2010 and effectively led to one of the greatest – and most negative – transformations of the region since decolonization, could qualify as a seventh critical turning point. In trying to understand what has shaped the geopolitics of the region, it is crucial to examine its history and the sort of dignity deficits that persist to varying degrees across the region. The geopolitics of the Arab-Islamic world are profoundly tied to world politics and have implications far beyond the region´s borders. This echoes Harold Mackinder’s previous geopolitical formula in his famous Heartland Theory, discussing geopolitical pivots.3 In 1919, following WWI, he had written that who rules East Europe rules the Heartland (Eurasia), who rules the Heartland rules the World-Island (the whole of Europe and Asia), and the world”. Nowadays, we could probably paraphrase this further into a different kind of dictum: “An actor with a vested interest in the Syrian conflict has a stake in global geopolitics and whoever wants to maintain regional or global leadership must get involved in resolving the Syrian conflict”. Nevertheless, relying on dictums such as these can lead to fallacies or to deterministic views of global politics. The validity of geopolitical formulae rarely lasts for more than a few decades, before new actors and shifts in power emerge. It could thus be said that the ascendance of China moved the zone of interest further east but that is not to say that the geopolitics of the Arab-Islamic became just a regional affair. As in the past, the Arab-Islamic world is of profound significance to global politics. The purpose of this chapter is to highlight some of the key trends across the region and look at endogenous and exogenous factors that have shaped the region in recent years and continue to do so presently – with a view to reflecting on the general direction for the present and coming years. A note on terminology: the term Arab-Islamic is preferred here to “the Middle East” because it covers the wider region – not just the group of countries in the Middle East. The Arab-Islamic world is by no means a homogenous entity. Tunisia, Iraq, Jordan, and Saudi Arabia are different sovereign entities, with different leadership structures, and at times divergent foreign policy goals and approaches. The region is, however, strongly bound together by historical, cultural and political connections as well as by a history of pan-Arab and pan-Islamic movements and trends. The clear definition of the “Middle East” has been contentious and divisive, and the selection of countries which are part of it rather arbitrary. European imperialism first crystallized a geographical notion of the “Near East” but the first years of the 20th century led to the appearance of a new geopolitical region, the “Middle East” – coined by an American naval officer, Captain Alfred Thayer Mahan. In his view, however, this region had rather vaguely defined borders, indeterminately comprising the area between the Suez and Singapore.5 Later, the “East” was divided up into Near, Middle and Far, and mostly as a result of British strategy. After WWI, a somewhat clearer delineation was established, whereby the Near East only comprised the Balkans – a decision taken by the Permanent Commission on Geographical Names of the British Royal Geographical Society. The portion of land from the Bosphorus to the east of India was to be called the “Middle East”. Winston Churchill, who became Secretary of State for the Colonies in 1921, set up a Middle Eastern Department in the Colonial Office and had a major role in how the region was divided, the future of Palestine, Transjordan and Iraq. In any case, the new re-drawing of the Middle East created some confusion for the Americans who for a period continued to use the concept as previously defined. Even in the case of Britain, the new interpretation of where the Middle East started and ended was a definition mostly accepted within the Royal Air Force. To understand the geopolitics of the Arab-Islamic world, it is imperative to make an incursion into its troubled 20th century history. During WWI, the greatest point of contention between France and Britain was over the French claims to Ottoman Syria. Absorbed in the trench battles on the western front, however, France encountered significant difficulty securing control over its Middle Eastern spheres of influence – and was apprehensively watching Britain’s increasing involvement in the region. For a start, the colonial powers started to become more interested in oil. Prior to WWI, the exploration of oil had been limited to Iran and what is today northern Iraq. But, as the British navy transitioned from coal to oil in 1914, and the availability of oil in the Gulf became evident – as well as the fact that it was relatively safe to transport – oil became increasingly important. At this time, in addition to British dominance in the region, France was well in control of Syria and Lebanon – together with the area it controlled in North Africa, and Italy was also becoming interested in the wider region; it occupied Ethiopia in 1935 as part of its imperial ambitions (“Africana Italiana”).11 At this point, the interest of the Soviet Union and of the United States in the wider Middle East region remained rather limited. The region saw itself divided and subjet to external influence. These foreign machinations cannot, however, be blamed for all the ills of the region and it is critical to underline a few other developments which are endogenous in nature, or that concern regional politics rather than foreign powers’ direct involvement. The interwar years, especially, saw profound changes within states. The most important of these transitions was the creation of modern state institutions, run by nationalist governments, and very expansive public sectors, employing a large number of people – including armed forces. A related development was the process of nation-building and the forging of national identities, but this task was immensely complicated given the rather clumsily drawn borders disregarding ethnic groupings or previous socioeconomic relations, and regional geopolitics. Iraq, for example, was among the most unfortunate of the British experiments, as the boundaries of the new state were the most arbitrary of all the territories in the post-Ottoman Arab world. This historical case is relevant not just for exemplifying the extent of British interference in the Middle East, but also to explain some of the recent challenges of the country in achieving social and political stability. During Ottoman times, Mesopotamia had been administered as three distinct provinces. The northern part of Mosul was connected to Anatolia and Greater Syria, while the southern region of Baghdad had strong trade links to Iran and the south-west. Basra, in the south, was more connected to the Persian Gulf and had trade ties with regions as remote as India. As they became the state of Iraq under British mandate in 1920, these regions could not be considered a political community “in any sense of the term”.13 Additionally, although the population displayed a strong Arab majority (around 80% Arabs and about 20% Kurds), the Arabs were divided along religious lines: over half of them were Shia and the rest Sunnis. Another important development across several countries in these years was the process of secularization, which was met with strong resistance and countermoves for a return to more traditional values. The strongest manifestation of this move was the Muslim Brotherhood, founded in Egypt in 1928, as a reaction to the secularizing trends across Turkey and the Arab World. The Muslim Brotherhood was originally peaceful but later turned to more violent tactics. The many social and political problems of the entire Arab-Islamic world in the interwar years and then during World War II simply indicated that although they were making strides towards nationhood and full independence, foreign influence and power games were hardly a thing of the past. Mismanagement from within should not be downplayed either. Additionally, some of the countries of the region had some political ambitions of their own, which added to the complicated geopolitical situation of the Arab Islamic world. Egypt, for instance, was eyeing Sudan (based on an older claim to the unity of the Nile valley) and Iraq was especially interested in the wider “Fertile crescent” area. A common political goal started, however, to emerge in the form of support for Palestine, which later led to the formation of the League of Arab States in March 1945, headquartered in Cairo. Together, countries of the League of Arab States vehemently opposed the partition of Palestine and the massive uprooting of the Palestinian Arab population as a result of the creation of the state of Israel. 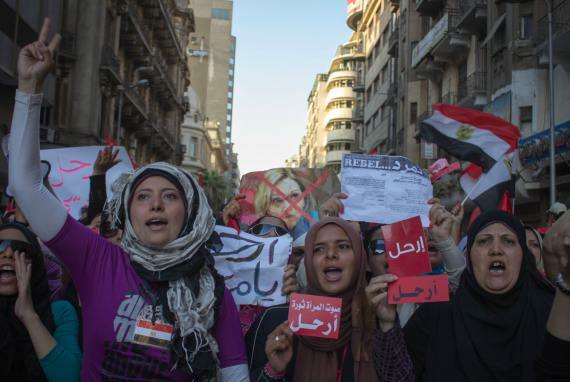 Egyptian women march to Tahrir square in an anti-Muslim Brotherhood protest in 2013. This is not to downplay the involvement and interests of foreign actors in the Arab-Islamic world during the Cold War. After World War II, several countries in the region achieved independence but others took decades more to do so: Tunisia and Morocco obtained independence from France in 1956 and Algeria followed in 1962. In 1952, the revolution in Egypt led by a group of military officers (the so-called “Free Officers”) headed by Gamal Abd al-Nasser, overturned the rule of the king and proclaimed Egypt a republic. The Suez crisis of 1956 was a watershed moment: in 1956 Nasser nationalized the Suez Canal, previously built with Egyptian labour, operated by a French company and used by the British Empire. The event led to an international crisis, military action by the French, British and Israelis, and finally a UN-backed ceasefire. However, by far, the greatest and most visible of the series of crisis in the Arab Islamic world during the Cold War, which still carries relevance in today’s politics, was the Arab-Israeli conflict. In 1967, in a pre-emptive strike, Israel defeated the joint military offensive of Egypt, Syria and Jordan. This left enduring memories in the region. It dealt a strong blow to Arab nationalism and prestige (and, to some extent, galvanized the deterioration of relations between Arab states and the USSR – for example, Egypt later cancelled the Friendship Treaty with the USSR), stoked Palestinian nationalism, and Israel continued its offensive actions to establish its position in the region. As it was becoming apparent that Israel had a strong ally in the US, it invaded Lebanon in June 1982 with tacit agreement from Reagan who was all too approving of actions to “go after” Soviet allies, such as Syria and the PLO.16 Syria maintained, however, closer relations to the Soviet Union until the end of the Cold War (and beyond). Several regional rifts occurred after the Camp David accords of 1978. One part of this agreement was an Egypt-Israel peace treaty that cost Egypt its relations with its Arab allies. It was soon expelled from the Arab League, whose headquarters were moved to Tunis. Additionally, Egypt stopped receiving subsidies from its oil-producing neighbors, making it dependent on the West. President Sadat grew increasingly unpopular. As social tensions grew in the country, the Muslim Brotherhood, which had been allowed to resume activities, achieved considerable success in its recruitment campaigns. Other militant organizations were increasingly active too, leading Sadat to take action and order mass imprisonments in September 1981.17 Soon after, in October, he was killed by members of the Muslim Brotherhood and succeeded by Hosni Mubarak, who ruled Egypt until 2011. Domestic politics were turbulent across most Arab-Islamic states in the Cold War years. Lebanon went through a civil war from 1975 to 1990, where both endogenous and exogenous factors contributed. Demographic changes and a very fragmented, sectarian social structure frustrated many Muslim Lebanese, who complained about the gap in representation between Christians and Muslims, despite the fact that Muslims outnumbered Christians. Then, exogenous factors added to the dramatic destruction of the war. Israel invaded Lebanon in 1982 and inflamed the political crisis for over a decade. Syria and Iraq traversed years of instability and consolidated brutally authoritarian regimes. A sense of solidarity and shared destiny united the Arab World despite the failure to prevent the emergence of Israel. Relations between Iraq and Iran became tense again after the Shah was overthrown and Ayatollah Khomeini came to power – the latter openly urged the Iraqi Shia to overthrow Saddam Hussein. The Algiers Agreement was officially abrogated by Khomeini in 1980, which soon led to the invasion of Iran by Iraq, and the beginning of the longest conventional war of the 20th century. The human and material costs were enormous. The war inevitably changed the geopolitical situation in the Arab-Islamic world. Foreign powers became heavily implicated, especially as weapons suppliers. Iraq’s oil exports and revenues were severely limited, and Kuwait and Saudi Arabia assisted Iraq financially. In these new circumstances, Iraq also changed its stance towards Israel and restored relations with Egypt, which started supplying it with ammunition and military support. Other allies were the USSR and France, and, from 1974, the US, which restored diplomatic ties with Iraq, having cut them in 1967. The US pressured its allies to stop selling weapons to Iran and visibly increased its own military presence in the Gulf. The war ended in 1988 with an UN-sponsored ceasefire. Iraq was badly hit by the war, large parts of its infrastructure were destroyed and a huge debt had to be paid to the Arab Gulf states. Yet another effect of the war was an increase in nationalistic ethos in a deeply divided country, as well as much more reverence for the Iraqi military, which increased in size and combat force.20 In August 1990 Iraq launched an ill-conceived invasion of Kuwait, blaming it for low oil prices – thus starting the First Gulf War. This rallied a large international coalition against Iraq, and led the UN Security Council to impose a round of sanctions against Iraq, further hurting the economy. From 1990 to 2003, the Iraqi economy was battered by hyperinflation, which affected common Iraqis the most, including widespread cases of malnutrition. Other countries not embroiled in war or recovering from a recently ended war, were traversing tense periods of social change and political crises. On top of this, the old conflict between Israel and Palestine took new turns. As with the Arab Spring in 2011, apparently small incidents proved able to trigger greater revolutions. In 2011, it was an incident between the security forces and a street vendor in Tunisia. In 1987, a car accident in which an Israeli military vehicle killed four Palestinians and injured others led to large-scale protests. Without much foresight, the Israeli army retaliated by killing protesters, which sparked a fullblown uprising in the West Bank. This was the beginning of the Intifada, the Palestinian resistance that was seeking an end to the miserable living conditions and restrictions placed on Palestinians. It soon acquired a more coherent and organized format, under the coordination of the Unified National Leadership. In 1988, Hamas – which is the Arabic acronym for Islamic Resistance Movement, was created, with a more intransigent and radical agenda than that of the PLO. The Israeli response was brutal and decisive in quelling the uprising and the forms of solidarity that had sustained it in the initial years. On the initiative of the Norwegian government, secret talks were facilitated between PLO and Israeli representatives, starting the Oslo Peace Process. The prospects of dialogue and genuine peace seemed real for a while, but the legacy of the years of meetings and negotiations eventually proved weak. 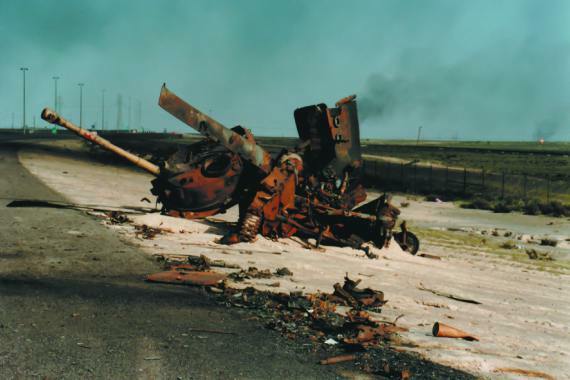 Remains of Iraqi armor on the road of Kuwait, after failed occupation attemp by Saddam Hussein. The discovery of oil changed the geopolitics of the region in profound ways and presented unique oppportunities and challenges. Countries in North Africa also traversed periods of crises following independence, or fully-fledged civil war in the case of Algeria. State-dominated economies, nationalizations and corruption often went hand in hand. However, for several years, the region also recorded dramatic gains in employment (in the public sector) and an overall improvement in life expectancy, decrease in infant mortality and an increase in literacy and school enrolment. The economic shocks of the 1980s and the decline in oil prices, which resulted in a decrease in public revenue and a greater strain on governments to meet public sector wage bills. Across the region, especially in Morocco, Tunisia and Jordan, policy reforms were enacted to cut subsidies and lower public expenditure. However, the 1990s saw a continuing downward trend due to the volatility of oil prices, the failure to implement robust economic reforms, and demographic changes that put high pressure on the labor market. Population growth peaked in 1985 at 3.4%, and although it fell to 2.2% in the 1990s, these trends had clear impacts, leading to the rapid expansion of the working-age population. 24 These factors, coupled with repressive policies, and the rise of social media contributed to the wave of Arab revolutions that started in 2011. The 9/11 attacks at the World Trade Centre marked a turning point in the region, as the US rallied global support for an invasion of Iraq and Afghanistan, which left aftershocks that still reverberate today. The war in Iraq affected the region enormously and deepened the sense of injustice, humiliation and deliberate disempowerment among Arabs. However, the dignity deficits plaguing the region were, of course, not only external. When the revolutions now collectively known as the “Arab Spring” started unfolding in 2011, they were first met with a wave of optimism – both from the inside, and from the outside world watching carefully. In hindsight, we could now argue that they were doomed to fail because they were seen as an attempt by the Obama Administration to undermine the status quo and empower the Muslim Brotherhood and Iran. The response from many countries was to reinforce this frail contract. Algeria, Libya, Egypt, Jordan, Morocco, Syria, Tunisia and Kuwait did precisely that: they increased subsidies on food and fuel. Other oil-rich countries have increased salaries in the public sector.26 What the region has yet to achieve is to re-think the social contract beyond these kinds of relationships and allow for more entrepreneurial, dynamic and competitive markets to emerge. However, the economics of the Arab Spring hardly tells the full story of the revolutions. Protesting on the streets of many Arab cities were not just the jobless youth, but also other citizens who were desperately demanding an end to abuses, and more openness. What eventually brought the region to boiling point was the lack of dignity. Dignity deficits, personal and collective, were the underlying cause of the revolutions. This is, of course, not dissociated from problems stemming from a lack of opportunities and employment, a sense of powerlessness and socioeconomic vulnerability, but was also grounded in the humiliation and resentment felt by so many people in the region for reasons that were not economic in nature. In addition, there was also a sense that external forces were interested in manipulating the situation and redrawing regional geopolitics. The event that triggered the revolutions was a ‘minor’ incident but a breaking point for people who had endured abuse from government institutions and who had for many years felt hopeless about their future. On December 17 2010, Mohammed Bouazizi, a street vendor in Sidi Bouazid, Tunisia, had his vegetable cart confiscated by the police and was asked to pay a bribe. Deeply shaken, Bouazizi, the breadwinner of his family of eight, went to complain to the provincial headquarters only to be ignored and dismissed. He returned to the same place an hour later and set himself on fire, in protest against the humiliation he had endured and the sense of powerlessness he felt. But the move was also a desperate call for dignity. In the words of his mother: “Mohammed did what he did for the sake of his dignity”. 28 Revolts and shows of solidarity quickly spread throughout the country and days after his death, on 14 January 2011, President Ben Ali fled the country. The protests, however, did not stop and gained terrain in other Arab countries. As I have written elsewhere30, the yearning for dignity is a driving force in history and the revolutions of the Arab Spring were a visible embodiment of that goal. On the domestic front, these countries fared quite miserably on the dignity index. Another particularly distressing event took place in 2014. In June, the Iraqi army capitulated in a matter of days faced with the strikingly fast advance of ISIS. This event was the culmination of several factors not without precedent across MENA. While the very creation and rise of ISIS was a byproduct of foreign meddling in the region (it is now known that the group appeared following the US invasion of Iraq in 2003, and the premature American departure), domestic failures should not be downplayed either. Indeed, when domestic inefficiency meets foreign meddling, the result is a catastrophic combustion. The most significant test for the Iraqi army since the US invasion ended as an extraordinary failure that created the possibility of complete state dissolution. In 2013, the Iraqi government had spent $17 billion on its security forces ($1.3 billion of which was funded by the US), yet 30,000 Iraqi soldiers fled in less than 48 hours when a band of less than 1,000 ISIS terrorists smashed their way into Mosul.35 The fall of Mosul was with a notable shock for the government, which accused the army of betrayal. At the same time, the event exposed some of the deeper problems of domestic mismanagement. The dignity deficits plaguing the region were, of course, not only external. In July 2017, the government declared Mosul “liberated” from ISIS, following heavy fighting and military support from the US. Yet eliminating ISIS from Iraqi territories does little to end the cycle of instability and state weakness. Iraqi Kurds have recently mounted a campaign to rally US support for an independent Kurdistan. A referendum was scheduled for 25 September 2017, announced by the president of Iraqi Kurdistan. The bid for independence spans decades and was fueled by repeated episodes of alienation. Indeed, at almost all points in their history inside Iraq, Kurds struggled with the centralized rule in Baghdad and felt their rights were not duly respected. Although under the Constitution, the Kurdish region is entitled to 17% of the national budget, in 2014, after a dispute over oil sales, then-Prime Minister Maliki refused to send the required payment to the Kurdistan Regional Government.38 The US and other regional players might eventually get involved diplomatically, yet the problem ultimately remains a domestic one – as is the solution. In the aftermath of the Arab Spring, I advocated for indigenous solutions to the Middle East’s governance problems. There is no one-size-fits-all solution and initiatives that can be applied in some North African countries might not work well in the Gulf, and vice-versa.39 In order to tackle the many facets of the dignity deficits besetting the region – personal and collective – the countries of the region need to move forward decisively to improve their respective governance models and institutions, as well as to prepare for the technological challenges of today, and – critically – to build more robust economies by enacting reforms that diversify the economy, too often reliant on oil. 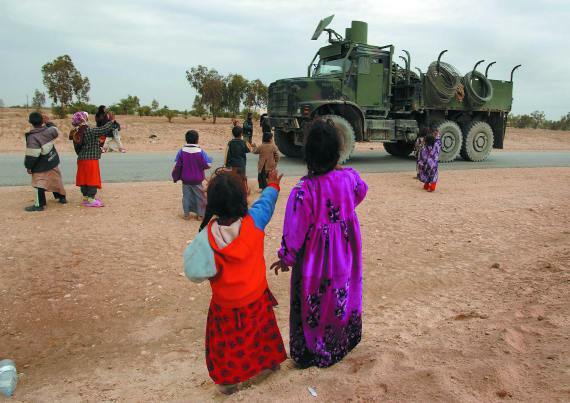 Military vehicle greeted by a group of children in Afghanistan. One way to break the prevalence of Eurocentric assumption about the rise of the West is to give the Arab-Islamic world due recognition for its contributions. This is important because the incorrect narrative about the rise of the West has given rise to a misleading image of a progressive and superior West, versus an inferior, stagnant or regressive Arab world.43 This has infringed upon the collective dignity of the Arabs and it is important to repair this misconception both for the sake of doing justice to the Arab contributions in the rise of the West and human civilization as a whole, and also to help dissipate the idea of an incompatibility and inherent discord between the two. Left: US Army deployment in a village in Iraq. Right: Flags in demonstrations of support for the Syrian people in Europe. As this chapter goes to press, the Arab-Islamic world has unresolved conflicts and a great deal of uncertainty still plaguing its development prospects. But it is also a region moving at multiple speeds. Some countries such as the United Arab Emirates and Saudi Arabia are among the fastest growing economies in the region, focusing on innovation and ways to diversify their economies (see, for instance, Saudi Vision 2030). Although still faced with great macroeconomic challenges, Tunisia, Jordan and Algeria are also displaying some positive signs of growth. Then, there are countries like Syria and Yemen, where the very survival of the state remains uncertain, with wars raging on, and where humanitarian crises of dramatic proportions prevail. Iraq has expelled ISIS but is reeling from the tensions and instability left behind. Risks of violence between Arab Sunni and Shia are high due to brutal sectarian militias supported by Iran. While the solutions to these problems will differ from case to case, a common requirement across the region is that policy responses relate to the needs of the people in the region and that they advance dignity-based policies and models of governance, without regional or global interference or manipulation. When inefficiency meets foreingn meddling, the result is a catastrophic combustion. That is easier said than done, because political change is slow and requires a transformation at the neurochemical level. This argument seems surprising but it is grounded in neuroscientific research, which shows how power manifests itself at the neurochemical level. Power is expressed neurochemically by an increase in the dopamine level, the same neurochemical that produces a feeling of pleasure, aids in learning and is present in reward-based behavior. Power also produces a ‘high’, which is extremely addictive, meaning that the more power one has, the more power one seeks to accrue. In some sense, we are all addicts in some way or another, as our dopamine flows push us to engage repeatedly in reward-based activities. Leaders in positions of power, especially authoritarian rulers who enjoy extreme power, will find it extremely difficult – indeed, painful – to relinquish their power. Many would rather die than give it up. In the absence of a system of checks-and-balances, the quest for power can lead to more macabre results.44 This insight from neuroscience not only explains power in neurochemical ways, but also provides hints about political change. To transform leadership cultures that have powerful, autocratic leaders at the helm, the best solution is to proceed gradually. But if history is any indication, change will occur sooner or later as humanity inevitably moves forward in a quest for personal and collective dignity. It is difficult to foresee the future trajectory of the Arab-Islamic world, a task also complicated by the fact that the countries of the region do not experience the same nature of challenges, and that the gaps between them are in fact widening. What can help repair the fractures in the region, and between the region and the outside worl, is education. 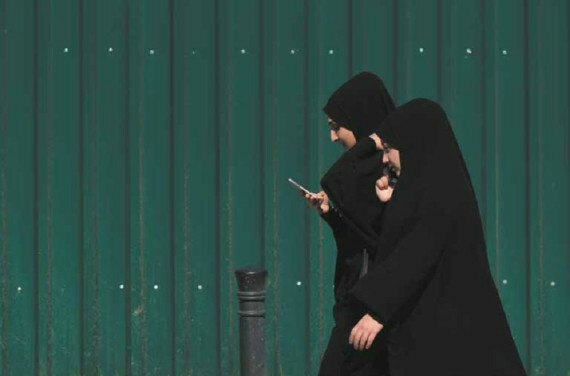 In the Arab world, the impact of new technologies will be felt in very different ways. A likely scenario is that new technologies will deepen the divide in the region, with some more capable of bearing the costs of integrating new technologies than others. Our brains are highly malleable insofar as our neurochemistry can be altered by new information and new exposure. Knowledge and education are critical in demolishing sources of preconceptions, prejudice and tension. Such initiatives are more critical than ever. Education that teaches more tolerance and transcultural harmony is needed both within the region and beyond. Technology and tradition come together in the Arab world. Almost three decades ago, at the end of the Cold War, predictions of an “end of history”, defined by the victory of liberal democracy, gained widespread popularity. We know in hindsight that such forecasts turned out to be exceedingly optimistic. Liberal democracies, while they remain the most successful forms of governance thus far, do not resolve dignity deficits. Political freedoms empower people to vote, but do not prevent marginalization, alienation and the many other forms of discrimination, meaning that much more effort is needed for reforming democratic governance to insure inclusive policies.53 Accountable and transparent governance that includes placing dignity at the heart of governance models is the only way ahead, and it is the most certain formula for Arab-Islamic countries to succeed in moving forward. Each country needs to come up with its own formula for accountable governance that meets its cultural specificities (without cultural relativism) to be sustainable, secure and prosperous. 1 Nayef Al-Rodhan et al, Critical Turning Points in the Middle East 1915-2015 (London: Palgrave Macmillan, 2011), 167. 3 H.J. Mackinder, “The Geographical Pivot of History”The Geographical Journal, Vol. 23, No 4 (April 1904), pp 421-437. 6 William L. Cleveland, Martin Bunton, A History of the Modern Middle East (Boulder: Westview Press, 2009)162-163. 8 Avi Shlaim, Israel and Palestine. Reappraisals, Revisions, Refutations (London: Verso, 2009), 4. A. Shlaim attributes this quote to Arthur Koestler. 10 Fred Halliday, The Middle East in International Relations. Power, Politics and Ideology (Cambridge: Cambridge University Press, 2008), pp 82-83. 13 Cleveland and Bunton, Op. Cit., 204. 15 The Brookings Foreign Policy Studies, Energy Security Series, The Russian Federation, October 2006, 11. 16 For a more detailed account of the Soviet policy in the Middle East, see Fred Halliday, Soviet Policy in the ‘Arc of Crisis’, Washington DC, Institute of Policy Studies, 1981. 17 Cleveland and Bunton, 381-382. 21 Michael Spagat, “Truth and death in Iraq under sanctions”, Significance (September 2010), 116-118. 22 Cleveland and Bunton, 451-452. 24 Tarik M. Yousef, “Development, Growth and Policy Reform in the Middle East and North Africa since 1950”, Journal of Economic Perspective 18:3 (Summer 2004), 97-101. 25 Adeel Malik and Bassem Awadallah, “The economics of the Arab Spring”, CSAE Working Paper WPS 2011-23, Oxford&Jeddah, December 2011, 6-7. 43 Nayef Al-Rodhan (ed), The Role of the Arab-Islamic World in the Rise of the West. Implications for Contemporary Trans-Cultural Relations (Basingstoke: Palgrave Macmillan, 2012), 17-18. Al-Rodhan, Nayef. "The Arab-Islamic World and Global Geopolitics: Endogenous Vs. Exogenous Factors." In The Age of Perplexity. Rethinking The World we knew. Madrid: BBVA, 2017.